We would love to have you join us! Sunday school begins at 9:45 a.m., and includes classes for children, middle/high school youth, and adult classes in both English and Spanish. Our Spirited worship services combine the best of traditional and contemporary music, along with practical messages designed to help us all experience God's love and power more fully. Worship begins at 11 a.m., with Communion served on the first and third Sundays of every month. 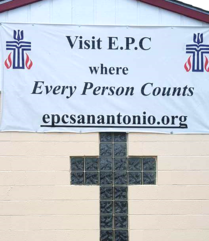 A community of faith on the south side of San Antonio where "Every Person Counts." Our helpful staff is available Monday through Thursday, 8:00 a.m. - 2:00 p.m., to answer all of your questions. We're looking forward to meeting you.